It is hard to believe that their story began just this last February. To be honest, I have been fascinated with their progress and eagerly awaiting the day when our patience would be rewarded. 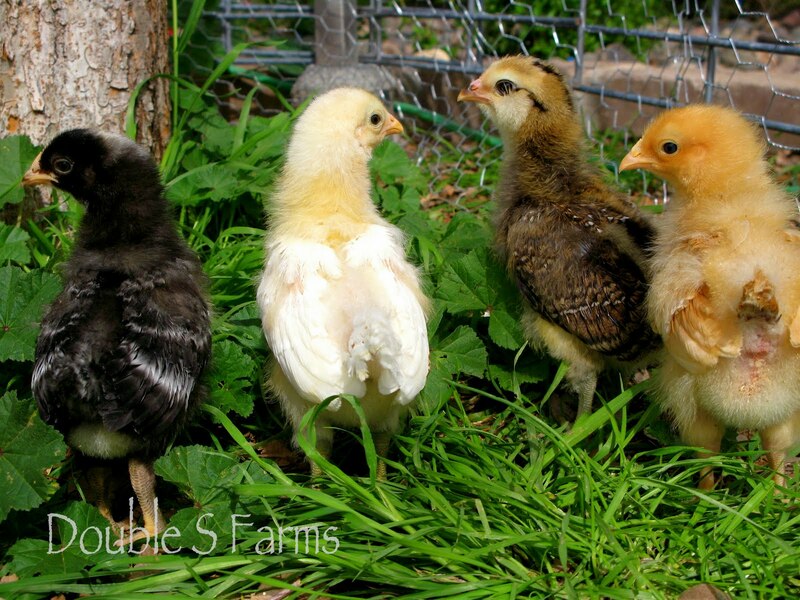 Of course, I am talking about the newest residents of Double S Farms…Ramona, Flo, Lucy and Effie. 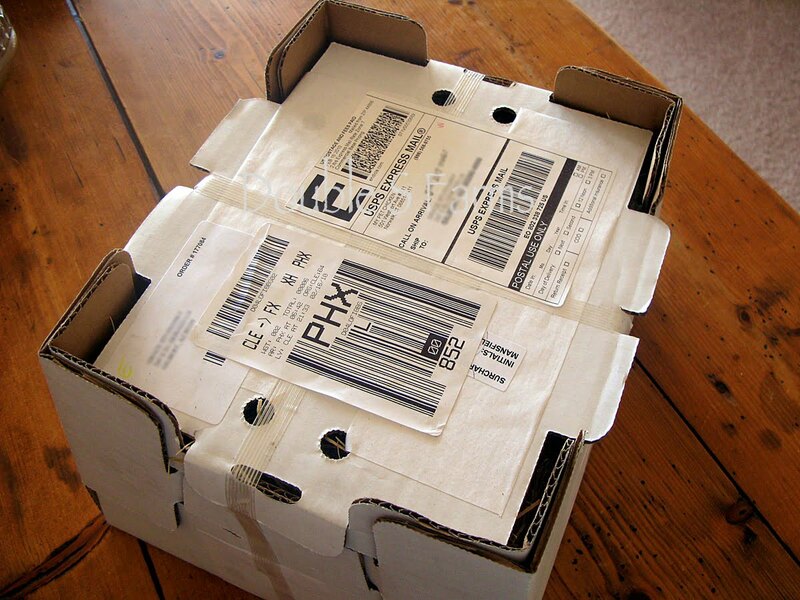 It seems like just yesterday that a box arrived in the mail for my sister, Chicken Farmer. I was almost as excited as she was and they weren’t even my chickens. Aren’t they the cutest balls of fluff? 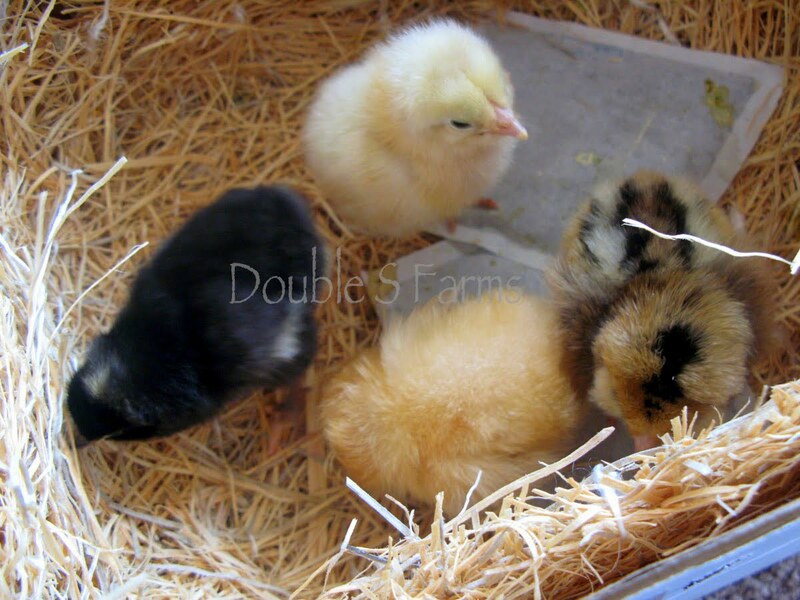 During our weekly dinners at Double S Farms, we would all look forward to seeing how quickly they were growing. As we got to know them better, each of their personalities became more defined and we enjoyed watching their antics. For example, did you know that chickens like macaroni and cheese? Especially when it has fallen to the ground from a child’s dinner plate. They enjoy playing in Little & Littlest Farmer’s sandbox. They love raiding the vegetable garden and eating the watermelon, until my mother, Pastor Farmer put an end to that 😉 They are now banned from entering the vegetable garden. Ramona standing guard to the entrance to the chicken yard. Their mornings are spent foraging by the fruit trees and along the foundation of the house, hoping to find some juicy insects. Flo, hoping that dinner is served outside, so she can sneak some bits that fall to the ground. Later in the afternoon, they head for the chicken yard and stand underneath the misters, which help to cool them off. I know that it isn’t a good idea to play favorites, but admittedly, Effie is our favorite chicken (but we don’t let the others know this because it might hurt their feelings). She loves people and even lets the boys pet her. Once she crawled next to Chicken Farmer and laid her head in her lap and promptly fell asleep. What’s not to love? Now, Effie may not win any beauty contests, but she has such a sweet personality that it is easy to fall in love with her. The chickens are all close friends and as evening falls, they venture into their coop without being told and settle upon their roost for a good night’s sleep. Now as much as we have all enjoyed my sister’s chickens, we have been patiently (okay, impatiently) waiting for them to begin laying eggs. My sister had put plastic Easter eggs in the nesting boxes hoping the chickens would get the hint about where to lay their eggs. Well, a few weeks ago, she went outside and guess what she found? Okay, hopefully you can tell the plastic egg from the real one on the left. Isn’t it pretty? In the last couple of weeks all four are now laying and last Thursday, my mother sent home a special surprise for my kids who love eggs…. Effie and Lucy lay the blue/green eggs and Ramona and Flo lay the brown eggs. Of course, I had only minutes to take this picture before the kids had me making eggs for their after school snack. *Please don’t tell the “girls” but before this experience my only thoughts about chickens were how I was going to cook them for dinner and how many eggs I would need to bake with. Who knew that chickens could be so interesting? You can see more of Double S Farms by visiting my sister’s blog Finley and Oliver. How sweet, Noelle. I love anything chicken-related. Thanks for sharing! This is such a neat post! I've never really been around chickens, but the chicks are so cute, and I can't imagine one like Effie getting on your lap, so cute! The eggs are beautiful. How wonderful to live somewhere to experience something like raising chickens! Chickens are a hoot to have around. Chicken Farmer's girls are adorable. How fun that the girls are now laying eggs! I agree, gardening with chickens is challenging, so keeping them out of the vegetable garden is very wise. We have about 3-4 more weeks to go before our young girls will be laying eggs. We can't wait! How fun to see those little babies growing up and now laying eggs! I bet those fresh eggs taste so delicious that store-bought eggs just can not beat! I think the chickens are just as cute as the chicks. What a neat story….I am so glad I stopped by to read it. I like the multi colored eggs. I bet they were good. How cool and those eggs look great. I never knew chickens could have different personalities until we had these feral chickens coming around for food. One, creatively named "Brown hen" was the most sociable, and would allow you to pet her etc. When the feral cats had kittens she used to "baby sit" them when their parents wanted a break! She and the grown up kittens, (which we tamed and adopted) would eat from the same bowl. Aw, they are so cute, and they eggs are beautiful as well. How lucky you are to get a gift of fresh eggs. I think I'd love some chickens myself. Dear Noelle, How amazing that you have 'chicken post'!! I could scarcely believe that they had arrived with the postman. And how beautiful they are. Keeping chicken is quite challenging but their antics are amusing and they have such varied personalities. There is nothing to compare with a freshly laid egg!! This was a fun and interesting post, thoroughly enjoyed by me as I sit here with a smile plastered to my face. Enjoy your chicken family members and their wonderful gifts. Those are lovely eggs. I love free range eggs and the shells are calcium for the compost bin. They're so popular at the farmer's market I must get there early if I want them. This was such a fun read, Noelle. When it comes to eggs there is nothing like a fresh egg for breakfast. The yolk stands so tall and the white doesn't spread all over the skillet. I've never heard of a chicken that would lay her head in a lap and sleep…that's so adorable. My sister and her farmer hubby have chickens, too. I'm definitely going to tell her this one! My friend doesn't need a clock – all she does is look out into the garden and see where her girls are and she knows approximately what time it is. Those chickens are so great and I'm glad they are laying eggs. What a great experience for the kids! It cracks me up that baby chicks come in the mail! It's so good to to see Kai up and around. Glad he's healing. I think it’s a treat every single time I lift the nesting box lid and find eggs. The Aftermath…. Mr. Shakespeare Comes to a Tragic End…..